Courtney is our newest intern at UARF. She is in the process of completing her Master's degree in Accountancy, and plans to graduate in May. Courtney started with UARF in January, and has since started updating the website; assisting UARF programming such as Starting Line, ArchAngels, and iCorps; and directly serving Akron-area startup companies. This will give Courtney valuable experience in business development and startup company support tasks, which will prove useful as Courtney completes her degree. Other than entrepreneurship, Courtney loves travel and her three rescue dogs. She spent winter break journeying through China and hopes to train her chihuahua Lily to accompany her on the next adventure. Nick Glavan is the shining star of the UARF office. He is currently pursuing an MBA in Management and has already earned his BS in Chemistry. Using these degrees he plans on going into a career working in marketing and new product development. Ever since he joined UARF in May of 2017, Nick has been using his knowledge and experience to assist with a bit of everything. His responsibilities include working on the Starting Line program, ARCHAngels, Spark Fund, I-Corps, marketing research, and stewarding of the various startup partners working with UARF. Through the research foundation, Nick has been given real world opportunities to practice all the skills he hopes to use in his future career. He has gained experience seeing the ins and outs of starting a company, performing market research, helping with customer discovery and analysis, and project management. Nick loves the theater, music, languages (especialmente español! ), cooking and baking (we’re expecting him to be on Food Network if the business plans don’t work out), and nearly every online/streaming television program (we don’t blame you, Nick, cause same). Aside from his career goals, Nick’s self goals include adopting his two dream dogs: a corgi and a German Shepard, you guys will be the three musketeers! Let us introduce you to the man that plans his days around his meals, his plain chicken, plain sweet potato, plain vegetable meals, Brett Nola. Brett completed his undergraduate degree in accounting and is currently a 3L in law school here at the University of Akron. 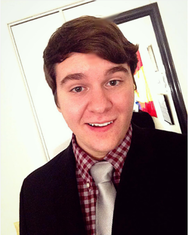 He hopes to use his law degree and experience at UARF to find a career in transactional legal and business work. For the past year Brett has assisted startups with legal support, the due diligence process, and organizing and providing feedback for the I-Corps program. UARF has helped him develop numerous legal skills, including reviewing and drafting agreements. In addition, he has learned what it really takes to start a business and how to make that process be as efficient as possible. Brett Nola’s interests are few and focused: sports and fitness. His top two sports to watch are baseball and football (if you can’t play ‘em, watch ‘em, right?) and working out is the highlight of his day (his fitness level is that of John Cena so don’t expect to see him at the gym). Throughout his lifetime Brett has accumulated multiple injuries in various parts of his body, but hey, he’s still functioning. Please do not injure yourself at the office, Brett, thank you so much. A couple years ago medicine met marketing and that is where Alizeh Khalifa came from. Alizeh is currently pursuing an undergraduate degree in marketing management and has already completed a minor in medicine. Since working with UARF this past year she has gotten experience in handling social media, creating the new UARF webpage, and making different marketing content such as flyers and videos. Being able to improve her editing and networking skills are some of the major benefits Alizeh has gained through interning here. Alizeh says her best experience was gaining another internship with the Northeast Ohio Student Venture and it is through both these internships that she has had the chance to work with various startups in the Akron area. Alizeh’s interests include finding new healthy lifestyle diets and never sticking to them (it’s the ice cream that gets you) and dinosaurs, with triceratops being number one in her book (we would have gone with a mosasaur, but we’ll let this slide). Separate from work, she is a big fan of crime scene investigation and behavioral analysis television shows. If you have tracked down the potential serial killers in the office please let us know asap. "Besides being surrounded by great mentors and colleagues working for UARF is great place for growth. Maybe more importantly UARF, with its many connections, was a great opportunity for me to meet a variety of people from different backgrounds which helped me expand my network. To this day I still use the knowledge and contacts gained through my time at UARF." "It is a great opportunity to meet really talented people and learn new technologies. If you have interest in the entrepreneurship, UARF is the exactly place you want to work for!" "I found that bridging the gaps between both legal and business disciplines to be quite attractive when looking for opportunities to pursue while in law school. UARF provides the best of both worlds for a JD/MBA student."